This series of photographs covers important steps of 1900's logging practices. Powerful steam machinery called steam donkeys or yarding engines were used to muscle giant old-growth onto flatbed railroad trucks. Ground yarding is represented in the first two photographs. 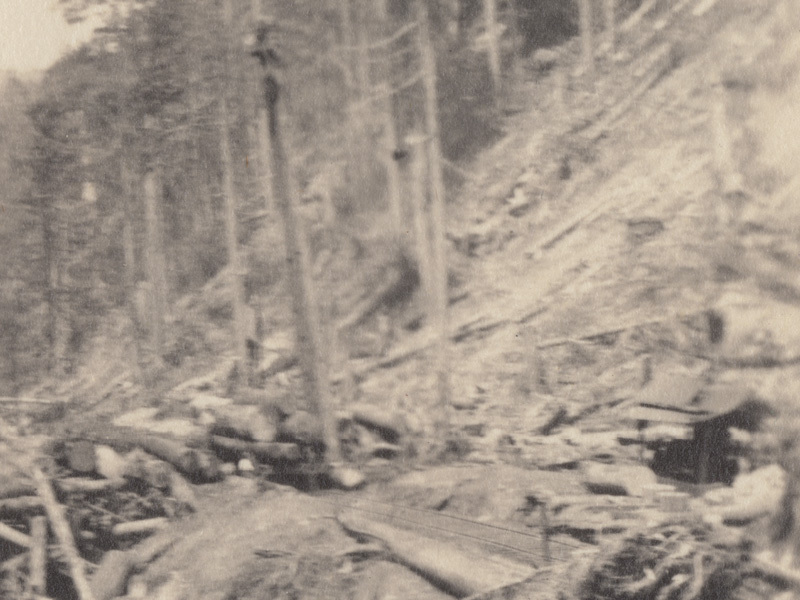 Though the picture is blurred, in the detail image, one can make out a donkey engine (right) and a spar tree, upright leaning slightly left (middle). Spar trees were used as high anchor points for the hauling cables to lift, swing, stack or load logs onto railroad trucks. In the detail you see the base of a spar tree near the neatly stacked logs. Looking closely one can also make out at least two cables radiating from it's top. Also visible near the same log stack is a small worker dressed in a white long-sleeve shirt, who is managing the loading of timber onto a flatbed, ready to be transported by railroad to mill. I hadn't noticed these details until the photograph was scanned at high resolution. We're looking at the fringe of E. A. Persson's employer's logging operation, fallen trees in the foreground and standing timber in to the horizon. The tracks barely visible in the detail below, for now I'm sure don't extend much farther beyond the stacks. And though the stands of Douglas Fir seem to go on forever, their fate remains crystalized in the wake of sobering devastation. A handwritten note left behind by my grandfather reads, "Two workers load a steam donkey onto a truck, notice the water tank mounted in rear." [Water tanks provided the steam powered engines their power.] Exaggerated scale and proportion was an overarching theme for the time, men and woman were constantly challenged by enormous machinery, ancient timbers and landscape. E. A. Persson caught a great sequence of a monstrous log being trucked down a steep section of track. The scene looks similar to a previous post comparing Persson's photographs with a few from the Kinsey Bros. collection in University Libraries Digital Collections. But it's definitely of another region, possibly down valley from the area depicted in this posts opening photo. I don't know well enough to say whether this system of transportation had a static line attached to the rail trucks tail end, or if the truck was like a runaway, bulleting down the natural embankment. As it gets closer to the trestle, the man walking casually into its path seems anything but alarmed. Perhaps the truck had a braking system built-in, creating drag as it gained more and more speed.